Eileen's Favorite Camp Crafts - Crafts For Kids and Others. Including: Eileen's Camp Crafts and Other Fun Things! This page of craft links covers a wide area of crafts. With additonal pages on my site for some of the more popular crafts: *polymer clay, * braiding and of course the most popular *Beadie/Pony bead animals. 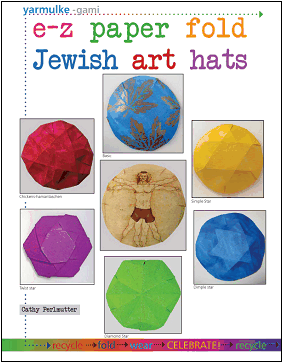 Additional crafts for Jewish programs can be seen on my *Jewish Crafts page or my new *Jewish Beadie Projects page. Also don't forget to check on my Parent/Teacher Resource page for links to helpful sites and companies that sell kits or supplies for many crafts. Simple Crafts (coloring books etc.) that parents of young children can do on the computer or in their home. Crafts teens can do by themselves. Some of these crafts I have used myself. Many are sites I have only recently discovered but see they have potential for crafters like myself. I hope you enjoy them as much as I do. ever time you visit a page on my site, as I update frequently and most computer networks save old copies of a site to "help" you. Ronin's and Micah's Pokemon Links and Crafts Page. Now has Dragon Ball Z, Digimon and more! Eileen's Baby Food Jar Crafts. Includes some hints on how to organize large craft classes. All made with rolled sheets of beeswax. Hundreds of craft and candles molds and supplies. Now in smaller easier to find catagories. Too many different crafts to list seperate! In addition to the *BEADIE ANIMALS, MAKING FRIENDS has lots of general crafts on this site. Including : *PRESCHOOL JEWELRY, *YUCKY CRAFTS,*FUN WITH LEARNING PAGES,*PRESCHOOL CRAFTS,*TIE DYE CLOTHES for your beanie babies and your Making Friends Paper Dolls. Many crafts use a computer printer to help you make professional and colorful designs. *DOT ART will work great with the Bingo Bottles we love at camp. (See Supply Page.) *SCOUTING PROJECTS,* and *FRIENDSHIP PROJECTS to name just a few! Looks like a great product for making flexible molds for soaps, polymer clay etc. It has very original crafts including candles,computer crafts, cake decorating, bookbinding and lots more. Homeschoolzone's Pitter Patter Craft Library.WoW! Some really great and unusual crafts!It has a great Crafts of the Weeks. It has a lof of Coloring Pages.It has been around for awhile, don't know how I could miss this! * Holidays, *Recipes *Recycle crafts *Homemade Gifts and LOTS MORE! It should take us months to look through it all! Holidays on the Net An award winning site. Has Holiday information, stories, games, crafts, greeting cards, links, teachers guides and MORE! Holidays include all major Jewish Holidays, Ramadan, Christmas, Halloween, all U.S. Holidays and more. Shrinky Dinks.com Has a site with directions for the plastic shrink art sheets. This is a fun craft. What ever you can draw or trace can be made into a keychain, magnet, jewelry etc. They feature on site free patterns of the month. I have done this craft with even 3 year olds using colored pencils. (on roughed up sheets - see their prebuffed ones.) We at camp used 1/4 sheets, punched with paper punch and made great key chains. No limit to the imagination on this craft. See my parent page for more info and links to ordering information. A great site with educational and fun things about the Earth. Has free craft projects,*earth beadie babies, recycle kits, *email stickers (electronic card),* coloring book, *Origami star, and more. Kidsdomain.com Has greatly increased their craft section. Hundreds of orignial crafts and links to more. (I have them on my fun and parents pages. )Including Shrink art backpack tags. (pokemon) I like the easy soap making project. Creativity Portal.com: Crafts, Music, Hobbies and More. Huge site with a search engine that has hundreds of links and free lessons for crafts. PBS Kids - Teletubbies has Activities including some crafts. Magic Dip. This is the tye dye type paint that you can use on paper, plastic, tiles, cloth and more. I have looked for this web site and someone finally found it for me. You can order online in different sizes and lots of great colors. See my picture page for examples of things I have used Magic Dip on. I used a large fish tank so the children could watch the colors swirl and "Magic" of the colors sticking on the project. Must be done in a well ventilated place. You also have to have a place to hang or to place a project to dry. Craftbits.comAustralian Craft Company sells international. Has unique kits including theraphy crafts. Also has lots of free project sheets and lessons for kids and other crafts. Ruth's Jewish Rubber Stamps and More! Ruth has some great stamps for sale but also offers ideas and lessons from everything from stamping ceramics to chocolates! crafts4kids.com A craft web site and PBS Television show "Hands on Crafts for Kids Television". Lots of craft projects. Floral Home Products is a wholesale florist supply company. It has a Learning Center with great crafts that use dried flowers, potpourri and more. Also has great Link page with sources for supplies and weddings crafts etc. About.com - Crafts for Kids has a great list of links for kids crafts and many original crafts. Has bible crafts, nature crafts, Pokemon, paper dolls, and more! Fun With Harry Potter. (teachers Edition) It is made for teachers but kids can use lots of this. Crafty Kids Kit Catalog has some free patterns and ideas. Surfing the Net with Kids- Arts, Crafts and Music pages. Childfun.com's Has many activities including coloring pages. Holiday pages.and Holiday activities. It has some fun Children Activities. Beaney.comThe call themselves the no.1 toddler site on the web. Real cute coloring, games and more. Public Televisions's Favorite Learn-to-Draw in 3-D series. Lessons and links for parents, teachers and of course kids! Everything Preschool.com Huge site with lesson plans, information sharing, Really does look like everything a Preschool teacher needs. Pre-school activities, crafts and lessons. Huge resources! Many subjects and holidays. Rubber stamps plus some unusual products for the real creative stamper. Glazes, brushes and some great projects. Has great lessons on Native American crafts. Including clay, metal work, leather, feathers, beads and more! Has recipes too. The PuzzleFactory.com Has great games etc. The coloring books are unique. You color on the web and then print it out. Animals, racing, construction vehicles, building etc. Scouts and Boy Crafts from About.com Has a lot of science and "boy" things. As a mother of two boys it looks great. But as a teacher of boys and GIRLS... Most Girls would love to make these too. Michael Arts and Crafts Store. Lists interesting craft projects for adults and children PLUS includes a web Coloring Book,a more mature, Master Class Coloring Book and Inter Note - web email greeting cards with music. Sesame Street Workshop Craft pages. Family.comPart of the Disney Company. Has a great Craft finder with hundreds of projects. See my Beadie page for pony bead crafts. Also new on my Jewish Beadie Patterns - Glass E bead Charms and Earrings on wire. Eileen's Beaded King and Queen Crowns. It uses pony beads and chenille pipecleaners. It was a huge success with all ages at camp this summer. Some used glitter beads. The boys liked the glow in the dark. More Bead Swaps for Girl Scouts on my Scouting Page. Lily (a beadie animal web site) has a great page on the hot jewelry craze of Power Beads. I have seen the fancy gift shops selling jade and crystal bracelets and calling them Power Beads. Well this is the way to use pony beads. She includes the chart of which color represents each power. An easy stringing project and the color is what makes it special. Something a little different. Make paper beads out of junk mail. It is included as part of Imagination Factory - Recycle Art Lessons. Including Drawing, painting, printmaking, collage, sculpture, holidays, fiber art, marbling and more. Go to previous activites. Twisteez.com I really like these wires. Works great with preschoolers for stringing beads for bracelets. They can control holding the wire better than cord or string. You can order the wires on line. Chatsco Distribution's Friendship Pin Patterns. 56 plus 26 alphabet letters. Wow! I think this can also be used to make suncathers. Also see my Japanese Crafts and Fun Pages for more! amazing new book! The paper folding Origami book is a download from the author. Origami using the Netflix's wrappers! Not an official Netflix's site. Just someone'r brilliant recycling of the part you through away from the return envelope. Speaking of Netflix, check out these great offers. Woman's Day Magazine Online has new paper crafts. Marilee's Paperdoll Pages and Marilee's Craft Links list links to Paper Dolls and to many Adult and Children Craft Links. DLTK's Printable Crafts for Kids. Great pictures for printing out and using in craft projects. Has many holidays, cartoons, (blues clues, Pokemon etc), circus, space and lots more. Proud Mommy's Children's Coloring Pages from all Over. and Paper Dolls on the Web. To play tangrams go to my fun pages. Make your own Tangram set. RECIPES - Science, Food, Bath, Crafts and More! Many of the general craft sites above have some great recipes. I try and point to them in my links so read above. Also check out my new Candle and Soap Making pages for more recipes. GIFTS IN A JAR By Margo of Beadie Critter fame. (see my beadie page for more info) Gifts in a Jar has great recipes to be used in adult craft/gift projects. Includes food and bath gifts you give in a glass jar! Many use sand art techniques to make layers in the jar. Very different. It also has links to other recipe sites. This is a huge and incredible site. This is their Kitchen Science. I am going to list it in my science fun too! Lava Lamps, Rock Crystals, Chocolate Modeling Clay and MORE! I have not tried any of these crafts yet. Looks great. Has recipes for silly putty, slime, paper mache and other fun looking stuff. Concepts in Candy. Has candy/chocolate molds for all occasions and many religions. These molds are very inexpensive. I have used some like this for plaster molds. Remember get a second set. Don't use for food and plaster. They can probably be used with other recipes that need molds. Everything Preschool Recipes-Cooked Clay Recipes. Craft Clay, Sand Clay, Cookie Clay, Modeling Clay, Baker's Clay and Coffee Clay. Bread Clay, Apple Cinnamon Clay, Sawdust Clay, Rose Petal Clay and Mock Marble Clay. Edible, Cooked play dough and non-cooked play dough. Paint, slime, crayons, ink, chalk and more! Everything Preschool's Recipes for home made silly putty. Australian store has lots of craft lessons and recipes for adults and kids. Check out these great Klutz Press books. Many come with supplies. The pictures on these links can change by themselves. If only a very large ad for amazon.com shows up rather than a bunch of indivual books, please hit the reload button on your webpage. I found many books, kits and supplies for Shrinky Dink Projects including the oven. Check books and toys. Check my site often as I will be featuring more individual craft books soon. Remember to hit the page reload button if you see Amazon ads and Not the recommended books. Put a picture under a transparent base plate and "trace" the picture with lego bricks! Some can even be made 2 or 3D and they can be even hung. Then go to Lego.com and you can download some holiday patterns for free! Do not forget to check out the Parent/Teacher Resource Link Page for catalog /supply company information plus other resource links! Books and Supplies for Beadie animals, beadies and beading.